Atletico Madrid remain on course for a second Europa League final in the space of three seasons after securing a 4-2 victory against Valencia in the semi-final first-leg at the Vicente Calderon Stadium. A brace from Columbian hotshot Radamel Falcao was added to by Miranda and Adrian Lopez to give Diego Simeone's side a commanding advantage ahead of the second-leg next week. Jonas and Ricardo Costa replied for the visitors at the end of each half, but the night belonged to Atletico who were too strong for their Spanish rivals. The home side dominated proceedings from the off with the majority of their threat coming through Arda Turan down the right-hand side. The Turkish international manufactured the first chance of the game, getting himself to the byline and pulling the ball back to Diego who forced a decent save out of Valencia goalkeeper Diego Alves. It took 18 minutes for the deadlock to be broken and unsurprisingly it was Atletico who went in front. Turan capitalised on some lacklustre defending from Adil Rami to divert an attempted cross off left-back Jordi Albi's foot and onto the head of leading goalscorer Falcao who claimed his 31st goal of the campaign. Rami attempted to make amends for his error fifteen minutes later but headed wide from a corner while at the other end, Diego came agonisingly close to poking home Turan's teasing cross, only for the ball to end up in the grateful hands of Alves. It appeared that Atletico were going in at half-time with a deserved lead in tact but in the third minute of stoppage time, Rami got up highest from a corner once more to glance a header towards Jonas for a tap in at the back post. Not to be denied, the 2010 winners came out flying in the second half and within ten minutes of the restart they had established a 3-1 lead. Centre-back Miranda headed in Diego's floated free-kick in the 49th minute and five minutes later Lopez latched onto a sloppy pass from Mehmet Topal to drive at the heart of the opposition defence and coolly slot the ball home from the edge of the area. Sensing goals, Atletico continued to push forward and they got their rewards in the 78th minute as Falcao bagged his second goal of the game in stunning fashion. Cutting in from the left-hand side, the 26-year-old lashed the ball into the top corner to leave Alves completely stranded. Despite a desperately disappointing display from Valencia, Costa's headed goal in the dying moments of the game will give them some belief that they can turn the tie around in the Mestalla. Atletico Madrid: Courtois, Juanfran, Miranda, Dominguez, Filipe Luis, Mario Suarez, Gabi, Turan (Tiago 82), Diego (Perea 88), Adrian (Salvio 90), Falcao. 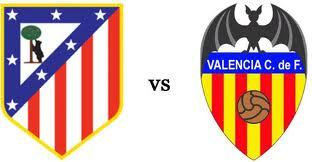 Subs: Sergio Asenjo, Tiago, Salvio, Paulo Assuncao, Koke, Perea, Martin. Goals: Falcao (18 and 78), Miranda (49) and Adrian Lopez (54). Bookings: Turan (41) and Dominguez (90 + 5). Valencia: Diego Alves, Ricardo Costa, Rami, Victor Ruiz, Mathieu, Feghouli (Canales 72), Topal, Tino Costa, Jordi Alba (Piatti 72), Soldado, Jonas (Aduriz 79). Subs: Guaita, Bruno, Maduro, Aduriz, Piatti, Canales, Parejo. Goals: Jonas (45 + 3) and Ricardo Costa (90 + 4). Bookings: Feghouli (15) and Diego Alves (68).